When a user submits a form, LibWizard has the ability to post that submission to a URL of your choice. You could use this, for example, if you are hosting some sort of web app to do something with that data (such as add it to a local database). Data can be posted to your URL in key-value pairs, comma-separated values, or JSON formats. Click on the Submission Behavior panel to expand it. In the Post Results To field, enter the URL where the data should be posted. If you have developed your own app (in PHP, for example), you would need to host it on your own web server in order to use it here. 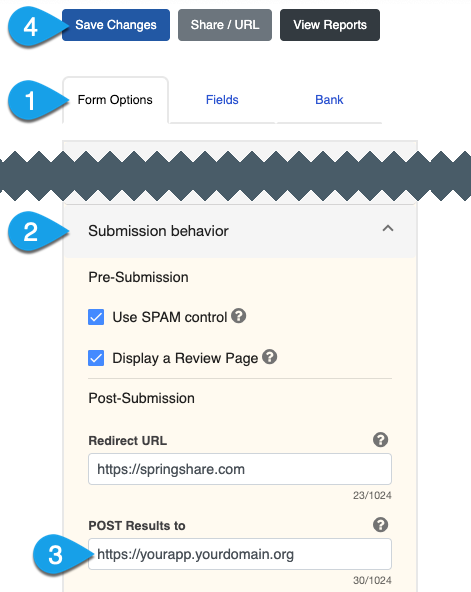 Using the Post Format dropdown, select the format for the submission data. You can choose from key-value pairs, comma-separated values, or JSON formats. This option only applies to the data posted to your URL. It does not affect the format of the data shown in email notifications or the form's reports.